Now, let's see the utility of post-order traversal algorithm, what do you get from it and when do you use the post-order algorithm to traverse a binary tree? As oppose to inorder traversal which prints node of the binary search tree in sorted order and can also be used to flatten a binary tree in the same order it was created, post-order traversal can be used to inspect leaves before you inspect root. It can also be used to generate postfix sequence. Now, one of the frequently asked questions is when do you use pre-order, post-order, or in-order traversal while dealing with binary tree data structure? The general point regarding usage of traversal algorithm is based on the requirement of your application e.g. if you want to inspect all roots before leaves use pre-order and if you want to inspect leaves before root then use post-order traversal. If you want to visit all nodes in the sorted order then you can use in-order traversal algorithm. You can also read Introduction to Algorithms to learn more about when to use pre-order, in-order, and post-order traversals. The recursive algorithm of post order traversal which we have seen in the previous article was quite similar to recursive pre-order and recursive in order algorithms, all you need you to do was adjust the order of recursive function call to match the order on which left subtree, right subtree, and root needs to traversed, but iterative algorithm of post-order traversal is very different than iterative pre-order and in-order traversal. In fact, it's the most difficult to implement among three traversal algorithm. Sure, you still use an explicitly Stack data structure to store elements, but the backtracking and then exploring right subtree is a little bit tricky to implement. If you look at this method you will find that we are examining leaves before examining root. We start the post order traversal from the root by pushing it into a Stack and then loop until out Stack is empty. At each iteration, we peek() the element from Stack i.e. retrieve it without removing and check if it's a leaf, if yes then we pop() the element and print its value, which means the node is visited. Here is our complete Java program to implement post order traversal of a binary tree in Java without using recursion. The iterative algorithm is encapsulated inside the postOrder() method. 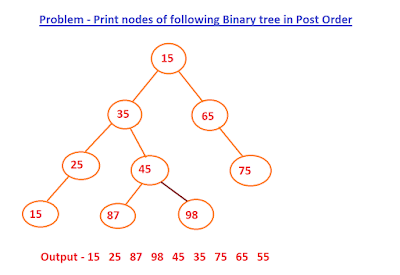 We have used the same BinaryTree and TreeNode class to implement binary tree and then added the postOrder() method to print all nodes of a binary tree into post order. The algorithm we have used doesn't need recursion and it instead uses a while loop and a Stack, traditional tool to convert a recursive algorithm to an iterative one. You can see that nodes are printed in the post order. You can also see the value of root node is printed last. That's all about how to implement post order traversal of a binary tree in Java. Just remember, it is also a depth-first algorithm, but you need to visit the left subtree first, followed by right subtree and root. The iterative version is also very difficult to implement you go exactly by the steps of post-order traversal. The version which I have shared is much easier to understand and implement. Thanks for reading this article so far. If you like this tutorial and interview question then please share with your friends and colleagues. If you have any feedback or question then please drop a comment and I'll try to answer your query. If you want to learn more about essential data structures and algorithms then just read Introduction to Algorithms. That's a bit presumptuous destroying the original data... Instead of doing that, you could keep track of hosts already output in a HashSet.